I love fall. It’s my favorite time of year. I love the crisp night air and the chilly mornings. I can hardly wait to get the wood stove cranked up and sit in my comfy chair with a blanket and a hot cup of favorite tea or coffee. I love hot soup, brunswick stew, and mugs of cider with a touch of brown sugar. I love the smell of orange rinds, cinnamon, and cloves simmering on the stove. I love pumpkins, apples, and butternut squash. I love sweaters, warm socks, and boots. I love a scarf around my neck and a hat on my head. I love the sound of tractors harvesting the fields, dried cornstalks, and bales of hay. I love the sound of leaves crunching under my feet as I walk through the streets of my little town. I love jars of acorns and wreathes of pinecones, but I especially love the mountains in the fall. I just love fall. What’s not to love? A few days ago, I was walking down the wooded, tree-lined street in the neighborhood where my parents’ live. I had hoped to see more of nature’s fall colors on this visit, but I confess my disappointment. It’s not peak season, yet, but I’m still disappointed. There are usually early signs of season change that spark excitement and anticipation, but the oak leaves just seem to have gone right to a dull brown, abandoning themselves to an early demise. The sycamores are a mass of mottled, diseased spots on slabs of yellow, not at all pretty and pleasing to the eye. I’m hoping the maples will soon burst on the scene with their usual glorious display of yellows, oranges, and reds to redeem what the oaks and the sycamores have lost. Even the dogwoods are lacking in their vivid red and green splendor this season. Fall seems to have fallen short. As I was walking around a bend on the country road that graces my parents’ neighborhood, I couldn’t help but notice the lone red leaf peering out of a sea of green on a small maple as I walked up the hill. Slightly blowing in the breeze it caught my attention and I stopped to take a look. It was already at its peak color, far ahead of the others. Vibrant with color. Set apart. Standing alone. 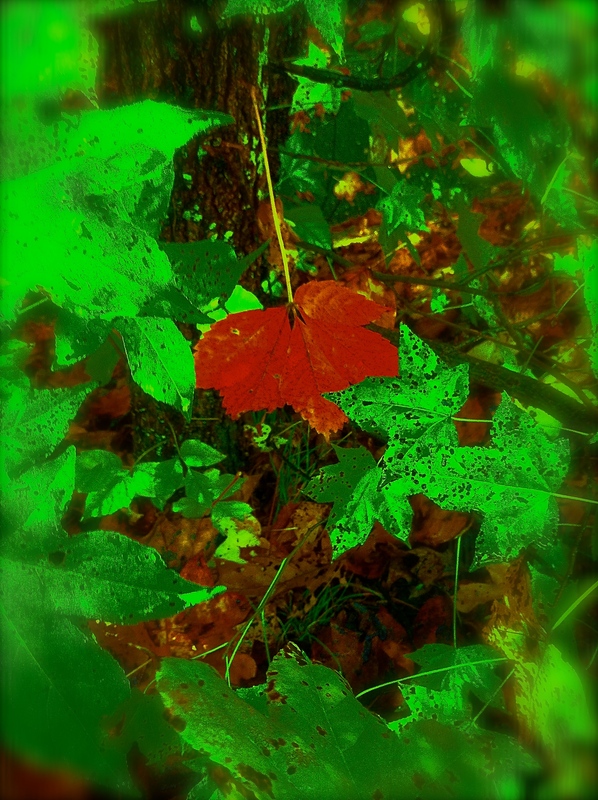 Even though the green leaves of this tree were mottled with ugly brown spots just like the sycamores, diseased and sickly-looking, this lone red leaf was beautiful, the deep red completely covering the ugly spots and drawing my eye, beckoning me to wonder. I couldn’t help but smile. Sometimes I’m a lot like that lone red leaf, all my ugly brown spots camouflaged by the Keeper and Sustainer of my heart, washed in the power of His cleansing blood. My heart beating in time with His, no matter the season. Without Jesus I would be abandoned to a life without much color. Dull. Mottled with brown spots of decay marring any real beauty. Following Jesus means that sometimes I may have to stand alone, but that’s not a bad thing. Because in a sea of green where others may want to look alike, act alike, and talk alike…I want to be uniquely different the way God created me to be. I’m not created to look like everyone else or be like anyone else, aside from Christ. I just love how He warms the crisp night air and blankets my chilly mornings. I love how He brings flavor to my food and salt to my earth. I love how He brings a sweet aroma to my home and embraces me with His comforting Presence. I love how He covers me with His wings and gives me shelter in His shadow. I love how He showers me with a harvest of blessings and speaks truth over me as I walk through the trouble-laden streets of life. I love how He puts a garland of grace around my neck and crowns me with splendor. I love how He waits for me on the mountaintop because I especially love meeting Him there, high upon the Rock. Yes, life without Jesus would be dull. He alone completes me and makes me whole. Life is full of seasons, but Jesus is present in every single one. I just happen to like fall the best. He’s the real Lone Leaf. I see Him down every street. In every tree. Around every bend. Vibrant. Set apart. Standing alone. Perfect in beauty. Unequaled in splendor. Always at His peak color. Drawing my eye, beckoning me to wonder. I can’t help but smile. I want to be like Him. I do. I may fall short. But I’ll never give up trying. I just wanted to thank you for this blog. My prayer is that God our Father will keep filling you up to overflowing with the beautiful way that you express yourself in these blogs. I so look forward to reading them! Thank You! Thank you, Jill. I really needed to hear this, especially today and I pray God blesses you the way you bless others. Just visiting your blog and came on this almost like you seeing that one red leaf so glad I read this it has helped me to see Jesus too Thank you. I hope you see Jesus in all of the beauty of Christmas this season and I hope your Christmas is VERY merry! Blessings to you!